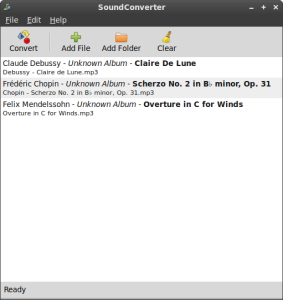 This simple tutorial shows how to install SoundConverter on Ubuntu 13.04 Raring, 12.10 Quantal, 12.04 Precise and Linux Mint via GetDeb repository. SoundConverter aims to be simple to use, and very fast. Thanks to its multithreaded design, it will use as many cores as possible to speed up the conversion. It can also extract the audio from videos. Once installed, open it from Unity Dash. PLEASE HELP. I got the following. 0 upgraded, 9 newly installed, 0 to remove and 6 not upgraded. Need to get 154 kB/1,005 kB of archives. After this operation, 4,224 kB of additional disk space will be used. The Getdeb is a personal maintained repository. It’s free and non-profit, the server might be overloading. Try it again or later! I just tried and it’s OK for me.